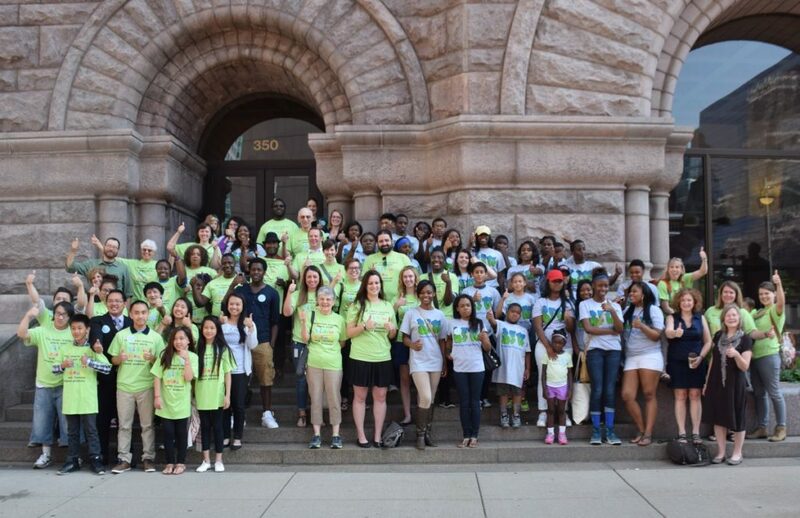 ANSR staff and volunteers, youth from Breathe Free North and Minneapolis Youth Congress and many other advocates celebrate the passing of the Minneapolis flavored tobacco ordinance. The Minneapolis City Council voted unanimously on July 10 to restrict the sale of flavored tobacco products, other than menthol, to adult-only tobacco shops. The Council also increased the price of cigars to $2.60 per stick. Four cities in Minnesota, including Maplewood, Bloomington, Saint Paul and Brooklyn Center, previously adopted policies that regulate the price of cheap cigars. However, no other Minnesota cities have restricted the sale of flavored tobacco products. Nationally, New York City and Providence, RI, have similar policies in place that served as a model for the Minneapolis ordinance. The new policy means that only about 15 of the city’s 400-plus tobacco vendors will be allowed to sell candy-flavored tobacco products. In order to sell these products, the stores must derive at least 90 percent of their revenue from tobacco and be adult-only at all times. Council Members Blong Yang (Ward 5) and Cam Gordon (Ward 2) co-authored the ordinance in response to input from youth in the Minneapolis Youth Congress and the Breathe Free North program at NorthPoint Health & Wellness. The youth said these products are appealing to young people in their communities. Opponents of the policy included convenience store owners and chains, such as Holiday, SuperAmerica, Bobby & Steve’s, retailer associations, and Altria the company that makes Marlboro and Skoal. Proponents included health groups and groups who work with youth. “This policy is an important step in the fight to reduce the harm caused by tobacco. These changes will protect youth from lifelong addiction to tobacco and the associated health problems. We are proud of the Minneapolis City Council for showing leadership and voting to protect the health of Minneapolis youth,” Betsy Brock, Director of Research at ANSR, said. The policy takes effect on Jan. 1. Become a Member Today!We invite members of the community to join our efforts by becoming an ANSR member. Click here to see our membership benefits.